BEST Dry Foods Your Golden Retriever Will Love! With their cheerful disposition and beautiful coat, Golden Retrievers are the quintessential family dog. Golden Retrievers are active, large dogs with big appetites. Proper nutrition is critical to this dog breed to prevent health issues and maintain its beautiful, shiny coat. Dog foods are not created equal. Some are loaded with fillers and grains while others are packed with artificial preservatives that are not good for your pooch’s health! But there are hundreds of dog food brands to choose from, how do you pick the tastiest ones for your pet? Don’t fret, we’ve assembled our group of Goldens to test some of the most highly rated dog food brands on the market to help you narrow down your search for the best dog food for Golden Retrievers! According to the National Research Council of the National Academies, an average 55 to 75-pound Golden Retriever with an active lifestyle must consume between 1,353 and 1,740 calories every day. On the other hand, Goldens with a sedentary lifestyle should consume an average of 989 and 1,272 calories daily. Older Goldens suffering from joint problems will require fewer calories than their active counterparts. Protein-rich dry dog food is best for the tartar-prone golden retrievers. A bowl of dry kibbles helps keep your dog's teeth nice and clean. You can also add a small amount of wet food with dry kibbles to whet your Golden Retriever's appetite. When combining dry and wet dog food, keep the amounts balanced to maintain the recommended daily calories for Goldens. Golden Retrievers are very lean, athletic dogs. This dog breed requires a lot of exercise and a protein-rich diet. The Association of American Feed Control Officials (AAFCO) recommends a minimum of 22% protein for pups while adult Golden Retrievers require about 18% good quality meat protein. Active dogs require more protein, particularly Goldens used for search and rescue, water sports, and tracking. When choosing the best food for Golden Retrievers, always go for brands that list meat protein as the first ingredient. Whole meats contain more water and concentrated amounts of lean protein. Premium dog foods typically contain a good amount of whole meat or meat meals. On the other hand, cheaper dog foods contain less desirable sources of meat proteins. They are labeled "digests" or "by-products". Goldens are generally healthy with an average lifespan of 11 years. However, they are prone to obesity no thanks to their huge appetite. A well-balanced diet should help keep your Golden’s weight in check. If your Golden is overweight, switch to a diet dog food to help your pet trim down. Avoid dog foods that list grains as the first ingredient. To maintain a healthy physique, carefully measure the amount of food you give to your Golden every feeding time. Remove the food dish if the dog food remains untouched 15 to 20 minutes after feeding. If you have two or more Goldens, feed them separately so one does not steal from the other's food bowl. Obesity may also trigger hip and elbow dysplasia, degenerative joint diseases common among active dogs. These conditions can lead to severe limping, injury, and genetic issues. One of the most common causes of joint problems among large dogs is rapid growth in puppies. The increasing muscle mass in pups causes too much stress on the bones. This will cause a domino effect on your pet's health that will lead to dysplasia. To control your dog's weight, always monitor your pet's weight and caloric intake. Regular exercise is also a great way to get Goldens to stay in shape and prevent bone as well as joint problems. In addition, give your Golden Retriever a balanced ratio of 1.2 parts of Calcium for each 1 part of Phosphorus (1.2:1) for average dogs. A good amount of fat is essential to a Golden’s daily diet. Apart from being a great source of energy, fat adds flavor to dog food and promote healthy coat, skin, and heart. Fat also promotes proper brain development so most dog foods contain DHA (Docosahexaenoic acid). Some vitamins are also fat-soluble. This means a small amount of fat is needed to promote proper absorption of certain nutrients. Just like protein, fat varies in quality. For dog foods, go for fat derived from chicken fat and fish oil. Avoid dog foods teeming with preservatives such as BHA, BHT, and Ethoxyquin. Nature's Variety Instinct Raw Market Nuggets contains raw ingredients including organic veggies and cage-free chicken. It's the perfect meal for active dogs that need more protein. I love how this unique recipe is made in small batches to ensure quality. The ingredients are freeze-dried to maintain freshness and lock in the nutrients. bones. To serve, just crumble a couple of nuggets into a bowl, add several tablespoons of water and mix well. Of all the dog food brands we’ve tested, I feel that the Instinct Raw Market Nuggets is the best for picky eaters. Boy, my Golden loved this dog food so much, he practically scarfed down his meal! The nuggets are also grain-free and gluten-free so there are no fillers that could contribute to your Golden’s weight gain or cause health problems. Checking the ingredients, I discovered that most of the meat proteins are derived from ground chicken bones, not muscle meat. I’ve research about the safety and nutrition of chicken bones and found that it is suitable for dogs on a raw diet. 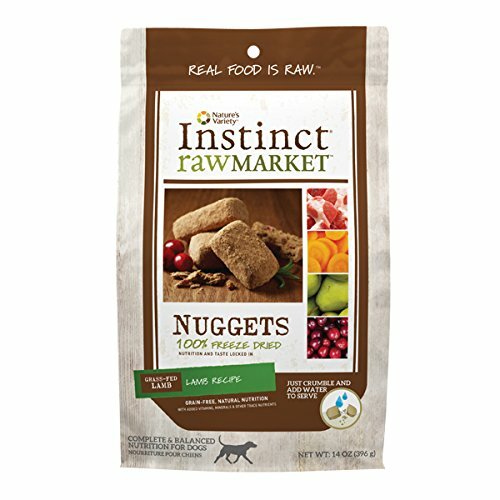 The Instinct Raw Market Nuggets makes a tasty treat for Goldens though I wish it comes in a larger bag! A medium-sized Golden Retriever is likely to go through a whole bag in just two to three days! The Shredded Blend is made for small and large dog breed alike. The shredded rice blend formula comes in four variants (Chicken, Salmon, Lamb, and Beef) and I got to try the Salmon variant. It lists salmon as the first ingredient so you can expect high levels of DHA from the recipe. This dog food offers a balanced combination of protein, healthy fats, and vitamins to promote immunity, strengthen bones, and support brain health. It's rich in Omega-3 and Omega-6 fatty acid to keep your Goldens' coat nice and shiny! This dog food offers a mix of hard kibble and shredded pieces for an interesting play of textures. If the kibbles are too hard, I'd recommend adding a little water before serving, which is what I do when feeding my younger Goldens. 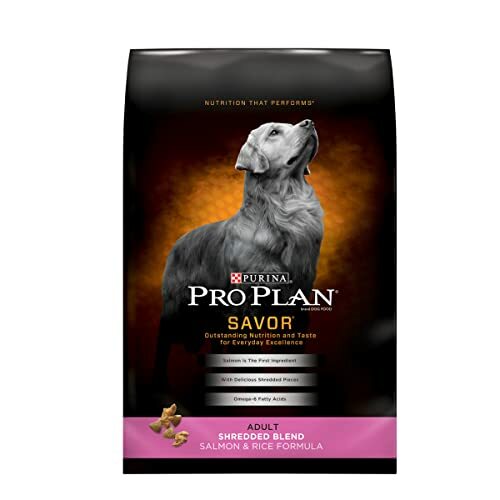 Purina Pro Plan Savor dry dog food also contains prebiotic fiber that helps improve digestive health so this dog food might be a great choice for Goldens with sensitive tummies. As with all formulas from this range, the Shredded Blend Adult Salmon and Rice Formula lists rice as the second ingredient. Grains are a great source of energy especially for active dogs but this might not be the best choice if your pooch is on a zero-grains diet or sensitive to gluten. Formulated for joyfully active dogs, Hi-Tek Naturals' Grain-Free Lamb Meal and Sweet Potato Formula is a dry dog food made from lamb meal, chicken, duck, and pork meal as well as sweet potatoes. The recipe is not only tasty (as our resident taster, Jelly Bean, attests), it’s also loaded with energy-giving nutrients that promote lean muscles, healthy coat, and bright eyes! Currently, Jelly Bean, my 2-year-old Golden Retriever, is on a grain-free diet and she just laps this one up like nobody’s business. I personally like how it contains sweet potatoes for energy. Sweet potatoes are also rich in beta-carotene, which reduces the risk of vision and heart problems. This antioxidant-rich recipe may also protect pets from certain types of cancer. Hi-Tek Naturals Lamb Meal and Sweet Potato Formula offers balanced nutrients, including plant fiber, vitamin C, and K plus manganese. These nutrients help maintain the right fluid balance in the body as well as improve muscle function. The combination of duck meal, pork, and chicken proteins help build muscles while imparting tasty, robust flavors. This is an excellent dog food for Goldens with grain allergy. I like the combination of ingredients as well as the overall quality of this specific range. Yes, it is more expensive than your average grain-based kibbles but nutritional quality and amount of kibbles per bag are worth the extra expense. BLUE Wilderness Dry Dog Food is a protein-packed, grain-free dry dog food with “recipes inspired by wolves' diet”. Yes, you read that right! 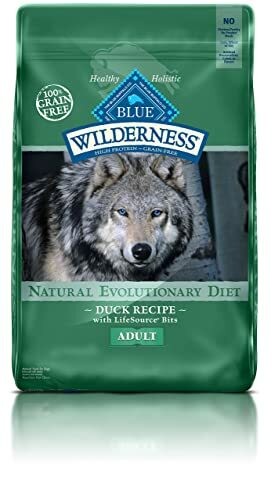 Now, I'm no expert on wolves but I do know they love their protein and this dry food contains salmon, chicken, and fish meal. It's also formulated with antioxidant-rich veggies, including carrots, blueberries, and cranberries. I like the variation of flavors in the BLUE Wilderness range. Some variants contain exotic ingredients that you don't see in other dry dog foods, such as halibut, alligator, and venison. The variant I got boasts of LifeSource Bits, which are basically crunchy kibbles that add a pop of flavor in every bite. Just like the other dry food brands featured in this review, BLUE Wilderness high protein adult dog food contains no grains, which is always a plus for Goldens that cannot tolerate gluten. Indeed, upon checking the label, salmon, fish meal, and chicken meal are the first three ingredients you will see on the list. This dog food is high in Omega-3 and Omega-6 fatty acids for shiny coat and healthy skin. It is loaded with a long list of antioxidants, including beta-carotene, vitamin C, vitamin E, plus B vitamins. BLUE Wilderness high protein adult dog food brings together an impressive combination of essential nutrients your Golden Retriever needs to stay healthy and then some! Rounding up our list of the top 5 best dog food for Golden Retriever is Royal Canin’s Breed Health Nutrition Golden Retriever Adult Dry Dog Food formula. I’ve been feeding my dogs Royal Canin since they were pups and this particular dog food is unbeatable in terms of value and quality. Golden Retrievers need a daily dose of vitamins to keep their coats shiny and healthy and that’s exactly what Royal Canin’s Golden Retriever adult dry dog food offers. I love how Royal Canin developed exclusive dry dog foods for every breed. Different dogs have different nutritional needs and it's nice that this recipe addresses all the nutritional needs of my Goldens. Formulated with Omega-3 and Omega-6 fatty acids, Royal Canin’s Golden Retriever adult formula supports healthy skin and coat, as well as healthy joint function and mobility. It contains complex nutrients EPA and DHA to support brain health, as well as taurine and antioxidants. 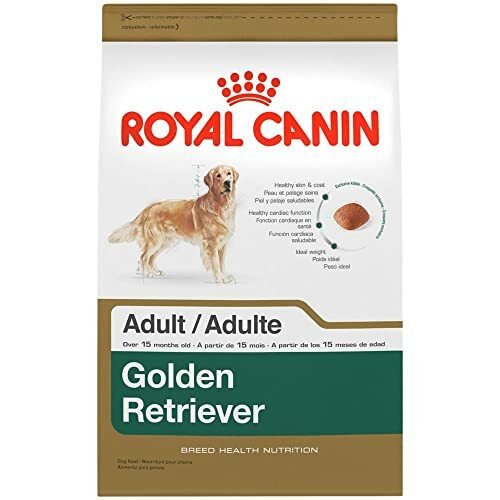 Because Golden Retrievers are prone to obesity, Royal Canin's Golden Retriever Adult formula offers balanced nutrients to maintain your pooch's ideal weight. The skin of Golden Retrievers is also more sensitive than other breeds that's why the formula contains vitamin E, C, and D to reduce the risk of skin disease. The formula is not grain-free so it might not be the best choice for dogs that are sensitive to gluten. Brown rice, oatmeal, rice, and corn gluten meal ranks high on the list of ingredients. These dry food recipes are not only highly rated, they are also loaded with all the nutrients your Goldens need to maintain health. It's hard choosing just one brand among these beloved brands but for this round, Hi-Tek Naturals trumps them all. It’s high in lean protein, essential nutrients, and vitamins to support muscle growth and brain health. Hi-Tek Naturals’ formula is also grain-free so even gluten-sensitive Goldens will love it! 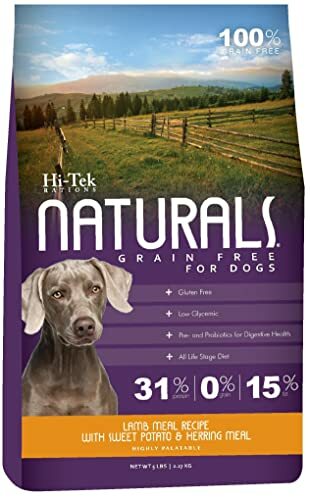 Simply put, the quality, value, and the well-balanced mix of ingredients make Hi-Tek Naturals’ adult dog food formula superior to other brands.